Discussion in 'The Lightweights' started by JohnnyShotgun, May 24, 2014. 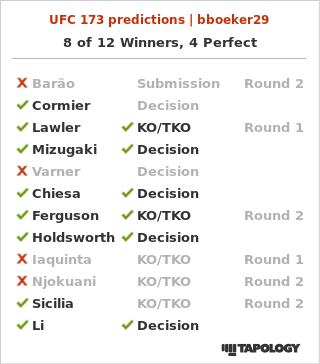 Damn right I did, I think Barao will win but I'm hoping for TJ. Before I advised her to switch to DC she had Hendo via submission; which is way worse than TJ. 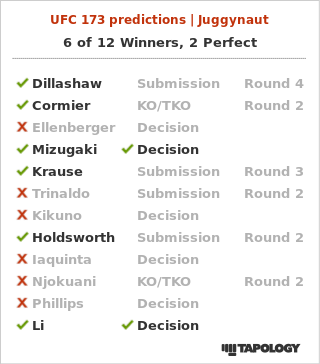 Only a fool wouldn't pick Dillashaw. 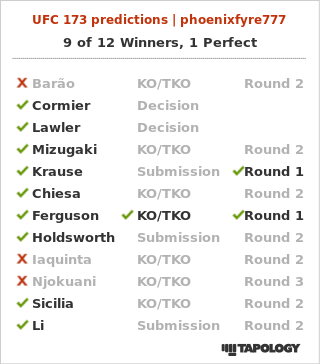 He will easily finish Barao. Clearly your girlfriend chooses her fighters better than she chooses her boyfriends. I see by your AV that you're a Hendo fan, must be fun these days. Well, after all, she was right. Yea I wasn't expecting that haha, granted I'd never seen Kikuno fight before; just figured that Tony would have issues with his style. Actually it is, I want TJ to win, and I'm perfectly happy picking TJ for the upset; however I believe Renan Barao will win. Simple enough.